Calculate your taxes both jointly and separately to determine which way saves you the most money. 1. Can My Estranged Wife File Married Filing Separately? 2. What Credits Do I Lose When Filing Married Filing Separately? Under the Internal Revenue Code, five filing statuses are possible, including "married filing jointly" and "married filing separately." Married taxpayers may choose to file either jointly or a status referred to as married filing separately. The choice of filing status affects many aspects of your tax return, including eligibility for tax breaks. While many couples benefit from filing jointly, under certain circumstances it is advantageous to file separately. When a couple decides to file their tax returns as individuals rather than as a married unit, some research may be required in order to determine which spouse should claim various credits and exemptions. When you file jointly, you must add together your incomes to determine your tax bracket. For this reason, filing jointly can put you into a higher tax bracket. Although Congress enacted legislation in 2003 to partially alleviate this "marriage penalty," you can avoid it altogether by filing separately. The qualifications for married filing separately do not include any additional regulations that may prohibit spouses from using this method of tax preparation. If you file jointly with your spouse and your spouse prepares your return, you can be held jointly liable for any underpayment, plus penalties and interest, if your spouse commits fraud or makes an error. Joint liability means that if one spouse can't pay, the IRS can get all of the money from the other spouse. By filing separately, you eliminate this liability. Certain tax deductions are available only if they exceed a certain percentage of your adjusted gross income, or AGI. The medical and dental expense deduction, for example, applies only to expenses that exceed 7.5 percent of your AGI, while you can deduct investment expenses only to the extent that they exceed 2 percent of your AGI. 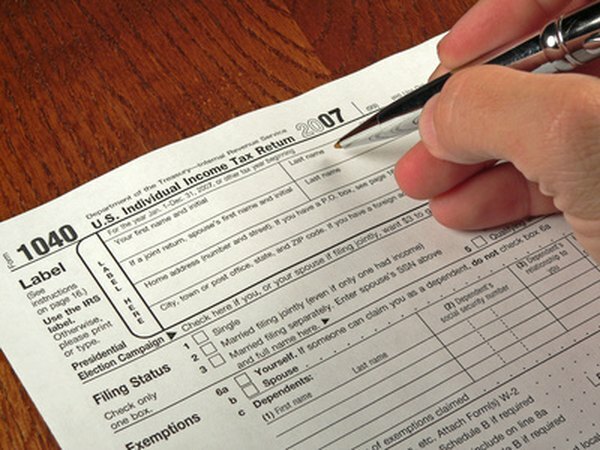 If you file separately, it may be easier for you to meet this threshold, particularly if your expenses connected to a particular deduction are higher than your spouse's, and your AGI is significantly less than your spouse's. If your filing status is married filing separately, you are ineligible to claim certain tax breaks, such as the child and dependent care credit, the tuition and fees deduction, the American opportunity credit, the student loan interest deduction and the earned income credit. This prohibition applies to both spouses. Tax credits are even more valuable than tax deductions because the amounts are deducted from your total tax due rather than from your taxable income. If you are married, how much of your joint income belongs to you depends on state law. Although community property law is complex, in community property states roughly half of your joint income belongs to you, regardless of how much you make. As of 2019, Arizona, California, Idaho, Louisiana, Nevada, New Mexico, Texas, Washington and Wisconsin are community property states. Prior to the elimination of many exemptions as part of the Tax Cuts and Jobs Act, parents were able to claim tax exemptions for each qualifying child. That being said, this specific exemption is no longer available for use. However, most parents of minor children can still claim a tax credit for each qualifying dependent. The Child Tax Credit for 2019 is $2,000 for each qualifying child. If you are filing separately because of a marital separation, the parent with whom the child lived with the most during the tax year is usually the only one entitled to claim the tax credit. Do Both Spouses Have to Be Present to File Married but Separate Taxes?